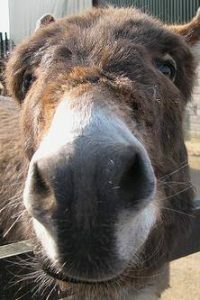 One of my friends posted a question on Facebook about Dominic, the Christmas Donkey, so I decided to see what I could discover about the etiology of our revered old friend… The truth is that the Internet is quite vacuous when concerning information about Dominic as can be seen in this article. Dominic was actually a super-distant cousin to Nestor the donkey, who was, of course, the other “Christmas Donkey” , and the “god-donkey” of Spieltoe the donkey  (In which -both relations certainly explain the pedigree and eligibility for his deserved title –the “Christmas Donkey”). Additionally, he was the great, great, grand-donkey of good-ole “Number 7”  -another fine donkey (Which, of course-of course, explains Dominic’s perfect answer to his job interviewers at a later date!). I don’t get it…can you please help me understand this brilliant article? 1. Nestor the donkey was was created by Rankin-Bass as a Christmas “stop motion” special in 1977. Nestor was the donkey that Mary rides into Bethlehem. 4. “Number 7” was the donkey in “Grizzly Adams” that “hee-hawed” loudly all the time…thus, Nestor’s “answer” in the Budweiser commercial could be justified and expected. 5. “of course-of course” is a reference to another equine, Mr. Ed. 6. The most famous donkey of all..is a play on the “most famous reindeer of all”, Rudolph -another 4-legged animal that was undervalued at the start. 8. Lou Monte, is the singer that made the Christmas Donkey song famous. 10. “more earthly type of king” is a reference to Budweiser the “King of Beers”. 12. Why did I spend time on this “ridonkulous” fiction? Because. Really, there is no more below here….